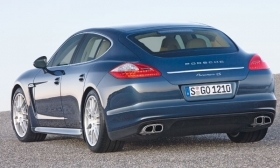 ZF supplies dual clutches to Porsche for models such as the Panamera. FRIEDRICHSHAFEN, Germany -- Transmission specialist ZF Friedrichshafen AG does not see a mass market for the dual-clutch technology that is sells to Porsche. "In the future, we see the dual clutch continuing to be more for the sports segment and especially for rear-wheel drive," said Gerhard Wagner, ZF's head of car powertrain technology. The company has been delivering dual clutches to Porsche for its 911, Boxster and Cayman models for about a year. Now it also provides them for the Panamera. But it still doesn't see a huge future for them. ZF's factory in Brandenburg, Germany, which produces about 200,000 manual transmissions a year, also now assembles the company's seven-speed dual clutch transmission, with a capacity of 50,000 annually. That will probably meet the volume Porsche needs. There apparently aren't any other customers in sight for the very sporty dual clutch transmission, which is designed for torque of up to 780 newton-meters, or 575 foot-pounds, and an output of up to 530 hp. At the same time, the transmission, known as the PDK at Porsche, is completely suited to a variety of Porsche vehicle layouts due to the sports car-maker's flexible, modular approach. At Porsche, the dual clutch works with the 911's rear engine as well as with the Cayman and Boxster's mid-engine configuration. It's also suited to the Panamera's front-engine, rear-wheel-drive combination, even with all-wheel drive and a start-stop system. ZF doesn't have a solution ready for the mass, lateral-front-engine market. Here pioneer Volkswagen dominates with its own system. VW's strength could be a problem for ZF long-term if the automaker were to decide to develop dual clutches for Porsche, which it recently acquired. This could also be a reason for ZF's relatively reserved attitude toward the transmission. In contrast, ZF is very satisfied with its new eight-speed, fully automatic transmission, which will first be deployed in the new 12-cylinder BMW 760i. Until now, only Lexus offered such a transmission, in its luxury LS 460 sedan. "We created a transmission with the perfect number of gears for BMW," Wagner said. "We absolutely could have achieved seven or gears, but eight gears just fit perfectly." Wagner expects the eight-speed transmission to replace six-speed versions in the next few years. "By 2013, with very few exceptions, we will have converted completely from six to eight gears," he said. But he does not see an increase beyond that number of gears in the coming years. Says Wagner: "Eight-speed torque converter transmissions will remain the state of the art for the foreseeable future."